Dave Toplikar Books | Welcome to Dave Toplikar Books, your source for Dave's latest writing projects. Should we be taking UFOs seriously? Earlier this year, major news operations were reporting on the Pentagon spending millions of dollars on secret UFO investigations. 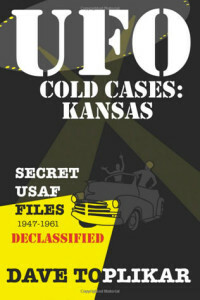 In light of that revelation, author Dave Toplikar has released another book that digs into the once-secret Air Force Project Blue Book files — UFO Cold Cases: Missouri, Secret USAF Files, 1952-1968, Declassified. Like his first book on Kansas UFOs, the author continues to shine a spotlight on many of the 701 incredible sightings made by credible people that were never solved. Filed away as “unknowns,” these cold cases from Project Blue Book are fascinating tales — and might be worthy of new official scrutiny. The book features multiple sightings made by military officers, a rancher, truck drivers, radar operators and others. They involve multiple sightings in Kansas City and St. Louis, and also Kirksville, Normady, Butler, Marshfield, Lake City and Gower. 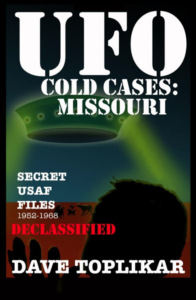 If you’re a fan of UFO sightings, the CIA’s Cold War era subterfuge, or just weird Missouri history, this book is for you. Get your copy today on Amazon.com. Spooky tales of visitors from Venus. Strange lights in the sky. Large shiny disks darting around planes. Even a sighting of a UFO pilot zooming off into the sky. Toplikar spoke on UFO sightings from his book on Kansas UFO sightings from Project Blue Book. See the Facebook Live video from the event. Hosted by Tim Beckley and Tim Swartz, the national podcast features Cheryl Costa and Dave Toplikar talking about their new books.